Typically, within commercial office buildings, we deliver holiday gifts around this time of year. At one of my buildings, I decided to do a few, smaller get togethers rather than spend the money on candy for each office. In this one building I decided to do a holiday cookie party. I called the bakery, asked if they could do something, "Festive". I said, "Think pumpkins, and cornicopias, and turkeys". They replied, "We can do pilgrims and Indians". I quickly responded, perfect. I hung up and thought to myself, "Are Pilgrims and Indians still politically correct?" But I put it out of my mind, as I was looking forward to the festive cookie gathering. Friday afternoon arrives, and the cookie delivery man drops of the trays of cookies. I bring them down into the common kitchen area and set everything out. 3:00 rolls around and the first of the tenants arrives. Several ladies from one of the businesses come down, look at the cookies, start whispering to one another and giggling. What are they laughing at? This is akward. Is my fly unzipped? Do I have a booger? One of the ladies walks over to me and says, "Kara, your cookies are naked except for a loin cloth". Oh that's right. 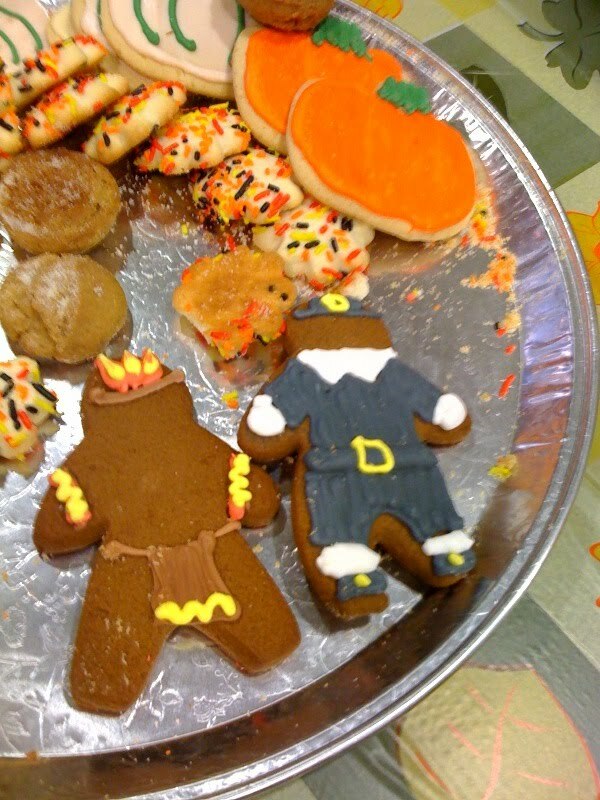 So not only did I have mildly offensive cookies with Indians wearing feathers on their heads, but they were also X rated. Way to go Kara. Guess next time I'll be more specific and ask for pumpkin and leaf cookies. If only it was a cake, you could send it in to Cake Wrecks (cakewrecks.blogspot.com).